To felt, or not to felt: that is the question. I have often avoided certain crochet projects because it required felting. Maybe I’m stereotyping, but when I think of felt, images of Sunday-school art projects come to mind. Plus, I’ve worked so hard to create a beautiful project with yarn I spent a small fortune on. So, do I really want to now throw it in the wash, essentially turning the project into a fuzzy mess? No, thanks, I’ll pass. If, like me, you struggle with the concept of felting, there is a resource available to help dispel the anxiety. In Interweave Crochet Spring 2019, Brenda K.B. Anderson gives a fantastic tutorial on how to create felt with crochet. Brenda breaks down the process with specific tips and tricks to help you achieve the felted look your project requires. For instance, I didn’t know you couldn’t use superwash wool! Brenda explains that the fibers are treated in such a way that they will not felt. One more thing to consider is the type of project you’d like to felt. On page 69 of Interweave Crochet Spring 2019, there is a pattern for the Sea Scale Tote. The bag was designed by Brenda K. B. Anderson. Coincidence? I think not. The tote is done in a rich plum tone. The yarn is Brown Sheep Company Nature Spun Worsted worked with a 6mm hook (affiliate link). With the yarn weight and hook size indicated, the project should work up quite quickly. The difficulty level is 2, which means easy. If the loops on the bag aren’t your esthetic, you can omit those, but they do represent the “sea scale” portion of the project. I would use this tote as a project bag or, possibly, as a reusable shopping bag. The large size and sturdy construction would make it perfect for those functions. 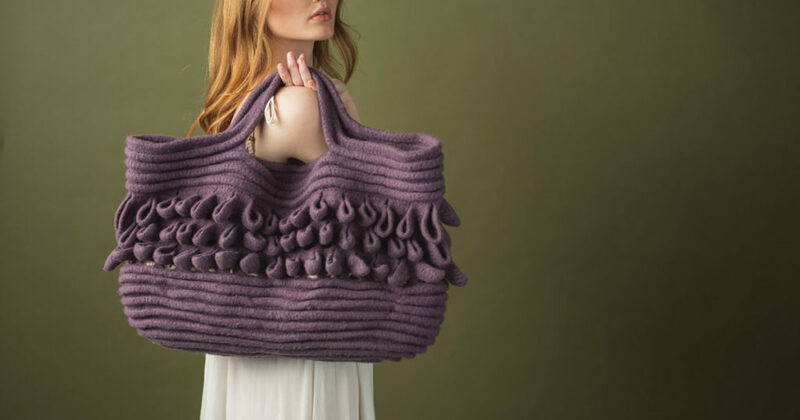 I like the Juicy Plum colorway featured in the issue, but the bag would also look great in Sea Spray, Elf Green, or Hurricane Seas. Brown Sheep Company Nature Spun Worsted has more colorways than you can shake a stick at, so I would recommend you get the color you like best. This is a fun, challenging project you can really sink your teeth into. Don’t let old fears and bad attitudes keep you from giving this gem a shot.